Synergy Automotive is crowned the UK’s number 1 leasing broker by industry body the Leasing Broker Federation (LBF). The vehicle leasing provider scooped a hat trick of accolades. 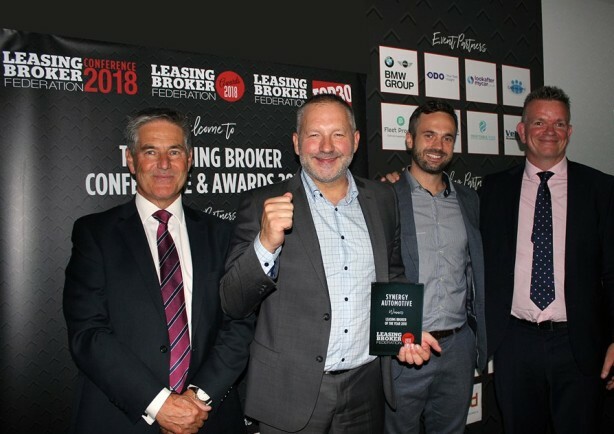 Taking the overall UK Leasing Broker of the Year 2018 Award, Synergy also retained its Best Medium Leasing Broker and Best Medium Leasing Broker Customer Service Award titles. The judging criteria included evidence of growth, excelling in customer service, compliance and Continuous Professional Development. The recognition comes in the most successful year to date for the 40-strong team which has doubled over the last 12 months. Synergy is outperforming household names in the UK and globally in an international benchmark used by Fortune 500 companies to measure customer loyalty. Since 2015 Synergy has sustained a ‘world class’ score of 94 in an index measuring customers’ willingness to recommend a company’s products or services. This score is confirmed as outstanding within the leasing sector where the average score is 52 and outside the sector where highest ranking companies include Apple with an NPS of 63 and Netflix at 62. The company’s commitment to consistently deliver an excellent customer experience is further acknowledged by Feefo. The global independent ratings and reviews site has awarded Synergy the Gold Trusted Service Award for delivering a 5-star rated customer experience for the fourth consecutive year from 2015-2018. A further milestone sees the recent completion of work to double the size of its Harrogate headquarters as part of a major investment and expansion programme.